Registration is now full! Fill out the form below to be put on the wait list. Trail Length: 4.5 mile loop trail; about 4 hours. Difficulty: The 4.5 mile route covers a variety of terrains including steep hills and stairs. Hiking boots and trekking poles are recommended especially if the trail is wet. Driving Details: This trail begins and ends at the Fort Hill parking lot. We will meet there at 10 am. Description: Fort Hill is an ancient earthen- and stone-walled hilltop enclosure constructed by Native Americans 2,000 years ago. Surrounding the Hill is 1,300 acres of one of the largest and oldest contiguous forests in all of Ohio. We will hike the scenic cliff-lined Gorge Trail skirting the banks of the Baker Fork stream that traverses the western flank of the Hill. We will then link onto the Fort Trail that will take us to the hilltop and enter the ancient hilltop enclosure. On this late-winter walk we will observe the winter landscape and wildlife, identify trees and plants in their winter form, and look for early signs of spring. Bring a daypack, water and lunch to eat on the trail. Directions: 13614 Fort Hill Rd, Hillsboro, OH 45133. To find the main parking lot, after entering the park’s main entrance you will pass the Museum on your right. Continue on the main road over a small bridge and you are there – you will see a trailhead interpretive kiosk and a picnic shelter. Marjie Becus is a botanist from the Cincinnati area. She grew up playing in the woods and that’s where she likes to be. She took various botany courses at the University of Cincinnati and did a vegetation study for her Master’s thesis, and since then has been involved in projects for the Ohio Division of Natural Areas and Preserves, and the Ohio Division of Wildlife. She’s done plant inventories of nature preserves and wildlife areas. She search’s for and writes reports on rare plants, in particular looking to verify species that were reported 10 or more years in the past, and she monitors the Federally Endangered running buffalo clover in southwestern Ohio. Ann Geise is a Cincinnati naturalist and renowned nature artist, She has been a student of natural history for as long as she can remember, learning the local plants and animal species, and how everything is interconnected. Her nature and art interests converged at Cincinnati Nature Center where she worked as Artist & Exhibits Manager for 19 years. Both Anne and Marjie are hike leaders for the Arc of Appalachia’s annual Wildflower Pilgrimage. Dress for the weather. Warm hat and gloves are essential. A total of eleven miles of hiking trails exist at Fort Hill, offering some of the best hiking in the entire state of Ohio. Fort Hill boasts a stunning natural area of 1300 acres, sheltering one of the largest and oldest contiguous forests in all of Ohio. It is estimated that the park preserves over 800 vascular species of plants within its boundaries and in 2015 Fort Hill was officially inducted as part of the Old Growth Forest Network. The major earthwork at Fort Hill is an ancient earthen-walled enclosure constructed on top of a large flat-topped ridge with a circumference over one and a half miles, its span interrupted with 36 definite made-man openings, and three more possible man-made openings. The wall itself ranges from 6 to 15 feet in height, averages 30 feet wide at its base, and encloses 35.3 acres. It was built to follow the natural contour of the rim of the hill, and is bordered on the inside wall by a substantial ditch. 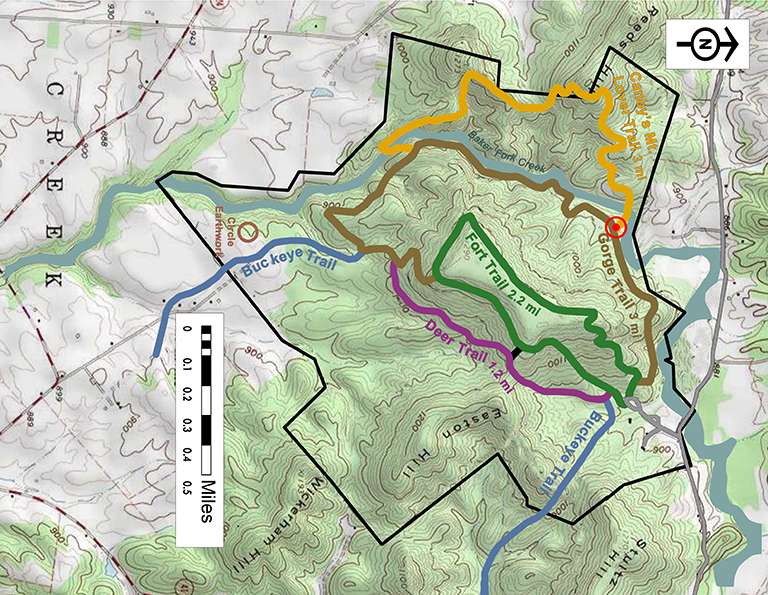 For detailed information on Fort Hill, including trail map, click here. Guided Hike Registration Now Full! Please fill out the information below to be put on the wait list for the guided hike. A confirmation will be sent to you a few weeks before the hike. Registration is limited, please let us know if you need to cancel so we can open your spot for someone else by contacting us at services@arcofappalachia.org or 937-365-1935.